This video is about an elementary school in the Boston area where children with disabilities are taught side-by-side their typical peers in the same classrooms. It looks so amazing. I'd love for there to be schools like this here in Minnesota. I wish they did more than just briefly mention cost. They hint that they get the same funds as any other typical elementary school, and that most schools aren't using the funds they receive for special education in the most efficient way. There are no specifics mentioned. But, as a school with a years-long waiting list and a higher than average number of kids with disabilities, they probably do get more funding than elementary schools with dwindling numbers of students. They totally and completely practice inclusion at this school. 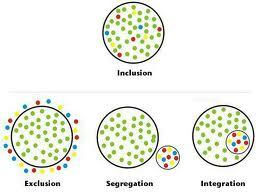 It's easy to mistake integration for inclusion. I think integration comes closer to describing how it is done at my boys' elementary school. I don't entirely disagree with that, in our particular situation. I think an entire day of experiencing inclusion in a typical classroom would be incredibly overwhelming for Zack and AJ. I don't think they would get a lot out of it. Of course that is why this school's program works best with children with "learning disabilities." I'm guessing that kids with more severe cognitive disabilities and behavior problems (like mine) probably don't get in. Still, this school is a gigantic step in the right direction. I wish more schools worked to treat all the kids as individuals who learn in distinct ways, and not just the ones with a recognized disability. I wish more schools embraced the differences. Watch Engaging Students With Learning Disabilities Early On on PBS. See more from PBS NewsHour.